Fellow, College of Commercial Arbitrators. Fellow, The Chartered Institute of Arbitrators, arbitrator and mediator for the American Arbitration Association, Member of the Advisory Council of CPR – International Institute for Conflict Prevention and Resolution, member of the CPR Panel of Distinguished Neutrals and CPR Council. Past Chair of the Federal and Commercial Litigation Section of the New York State Bar Association. Past Member of the Federal Bar Council Board of Directors. As a litigator and ADR neutral over the course of my career, I have participated on both sides of the mediation process including as a mediator for court annexed programs and independent appointments. I have had multiple rounds of formal mediation training in the course of my work with CPR and at its regular meetings among leading mediators from the U.S. and abroad (www.cpradr.org) and through court programs. My broad base of experience outside of my legal practice has been a good foundation for understanding the underlying context and dynamics of disputes and possible means of resolution. For complex disputes with potentially expensive preparation costs, I encourage early involvement of a mediator to help the parties focus the issues and their discovery needs in order to cost effectively prepare the dispute for possible settlement before the expense of full discovery and trial. I have served on arbitration panels under a variety of rules including AAA, CPR, ICDR, ICC, DIS (German arbitration institute) and court annexed programs. Recent cases in which I have served as an arbitrator include claims related to the mortgage backed securities market, international contract disputes between internet service providers, disputes between private equity investors and company founders and management, high level employment disputes and disputes under international distribution agreements. I spent my legal career as a business litigator handling U.S. litigation and international arbitrations under a variety of U.S. and foreign laws. I have handled litigation arising out of patent licensing agreements, unfair competition and trade secret and breach of contract claims involving complex commercial technical and accounting issues. I have litigated matters involving the federal securities laws and antitrust laws as well as state corporate laws. I have handled international energy project disputes, as well as project development and privatization disputes. Mr. Trueheart has acted as a party representative in a variety of international arbitrations involving large scale disputes over contracts in Europe, Latin American, the Middle East and India. I have worked under the rules of the ICC, ICSID, UNCITRAL, AAA, ICDR, CPR, DIS and other arbitral bodies. I have participated in arbitrations involving a variety of foreign laws including Swiss, French, German, Turkish, Emirates, Australian and others. Mr. Trueheart has extensive experience in the arbitration of international construction disputes, involving complex projects. These include projects in Mexico, Venezuela, Nigeria, United Arab Emirates and other countries in that area, India, and Turkey. The arbitrations were conducted under ICC, ICSID, AAA and other rules and involved a variety of foreign laws. The projects involved a variety of technologies and types of construction and usually involved claims for delays, changes, cost over-runs and related construction failures, design issues or owner related issues. In addition to serving as an arbitrator in general business and commercial disputes, he has represented clients in, served as director in, and/or been involved in arbitrations in a number of economic sectors including: international construction and energy projects, privatization, private equity, finance, real estate development, technology, internet services, sales and distribution, law firms and professional services; higher education, telecommunications and public broadcasting. Past Chair, CEO and Managing Partner of Nixon Peabody LLP. 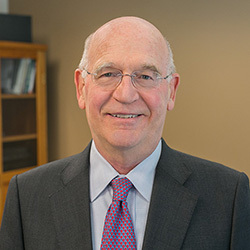 Past Chair and CEO of TerraLex (2011-2018), an international network of 150 independent law firms in 100 countries and 45 U.S. states comprising more than 19,000 lawyers. Past chair and trustee of a regional public broadcasting corporation. Current trustee of a leading technical university. Past director and current advisor for a regional telecom company. Past director of regional business alliance. Past member of a regional advisory board of leading banking institution. University of Michigan School of Business Executive Program.